ERIC ERIC DSR OF THE YEAR S U P P L I E S O N T H E F LY E 7 E By Amelia Levin Photography by Ben Rollins ERI ERI ERI ric Harrison is dressed in his standard uniform today. "I always wear black," he says, and I laugh. "No, like every day, all the time." Even while accepting his award for DSR of the Year at the FE&S banquet in May, he was decked out in a black tuxedo. That made sense, as it was a black-tie event, but Harrison paired it with a black shirt, vest and tie. No, this is not the color of his soul. It would be easy to see how one might think that way given Harrison's love of heavy-metal music, including the band Iron Maiden, and the fact that his cellphone's ringtone plays the theme song from the movie Halloween. In reality, though, his friends and colleagues will tell you that Harrison is extremely relaxed, easygoing and kind. The smile unleashed when talking about or pictured with his son, Dylan, shows a much softer side. Watching Harrison interact with a variety of people, he shows a warm and inviting personality. 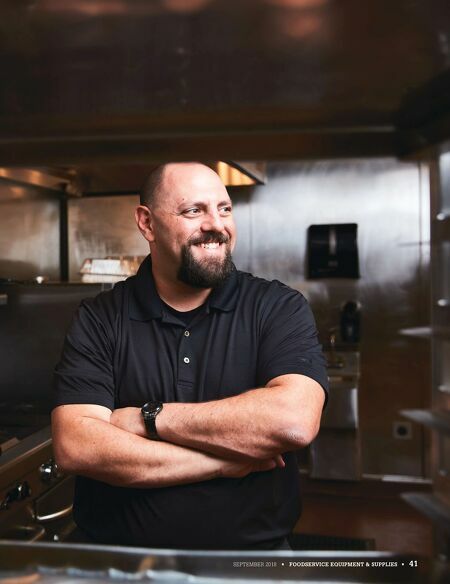 And when speaking with longtime friend and client Michael Cohen of Twisted Kitchen, there is a lot of sarcastic banter, smiles and laughs. With Harrison, there's always a deep knowing and understanding, even amidst strangers. This makes sense, then, why his longtime customers, and even days-old ones trust and value him so much. It's clear that his non-aggressive, non-pushy, trust-laden relationship-building approach has earned him not only repeat and loyal business but also much respect over the two decades in his career. It's all about starting small and earning trust first. "Why should I go into a potential new client saying, 'we're going to do this and that and this and that and then the customer feels overwhelmed and doesn't want to do anything?' 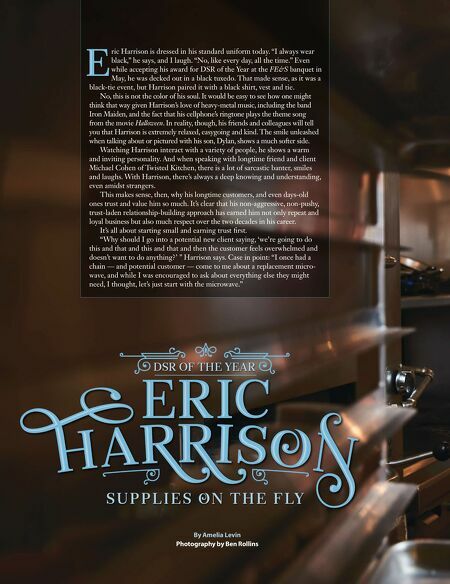 " Harrison says. Case in point: "I once had a chain — and potential customer — come to me about a replacement micro- wave, and while I was encouraged to ask about everything else they might need, I thought, let's just start with the microwave."